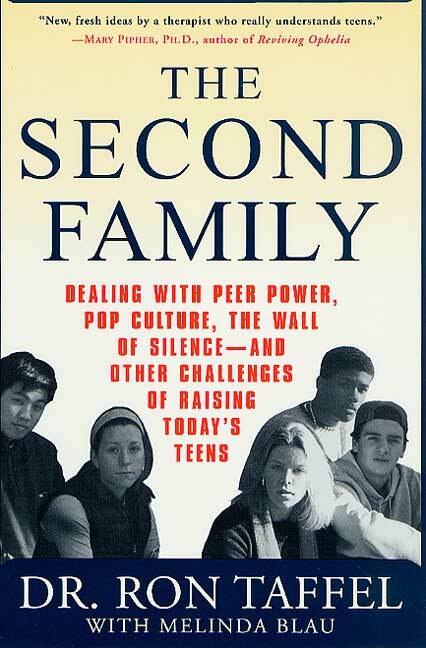 This is a graphic work about guiding teens through the realities of what I call ‘the second family’ – the peer group and pop culture that makes its way into every home. Featured on The Today Show I pull no punches as you will read in the reviews. The book has become a classic for both parents and child professionals, receiving an incredible reception on its publication and still does so today. Why? Because, in starkly explicit terms, I describe a phenomenon that until now has had no name. When I say “The Second Family” I mean the unprecedented collective power of the peer group and pop culture — a force so pervasive it often overwhelms the first family of adults at home and in school. The Second Family is about breaking myths: Peer pressure, as we usually think of it, is dead. Kids don’t make each other do things just to conform – live and let live is more the teen ethos than parents could ever imagine. Kids rarely rebel against adult authority – there is not enough of an adult presence to rebel against. Teens don’t necessarily stop talking to parents — if parents know how to listen to modern teens. Enriched quality time is old – comfort-time and knowing how to provide it to teens, is what kids crave. Kids lives are an open book — if parents know how to stop and pay attention. Teens help each other through their everyday dilemmas and problems — but still need parents who can help with their complicated lives. Derived from thousands of conversations with kids and adults, The Second Family uses real-life examples to bare the truth about the world of adolescence today, not just the problems and challenges but the healthy aspects of the second family: a secret moral code of peer support that surprises, boys and girls as best friends (without benefits), boys emotionally care-taking those in need, girls as powerful group leaders. In fact, the angry alienated face a teen shows at home is often the exact opposite of the loving, responsible person he or she is in the second family. Create realistic expectations, learn how to compassionately and effectively guide kids through a dangerous world. Learn how adults can help their kids battle the derisive “tyranny of cool,” social cruelty and navigate the possibilities of great friendship, broken friendships and 21st century romance. How parents can share “comfort time” with kids — and take a genuine interest in their world. Learn how teens must earn trust — work towards the privileges and ‘stuff’ many adolescents and adults think of as natural entitlements that come with age. Finally, I stress the importance of home and school working together — spelling out concrete, simple steps — to balance the powerful 21st century network our kids live in every day.